The CT Northern Lights participated in the nation wide Girls Hockey Day on October 2, 2011. The Lights providing a free clinic for all girl skaters aged 10 and under led by Jaclyn Hawkins, former UConn Husky and current professional hockey player of the Boston Blades in the Canadian Women's Hockey League (CWHL). 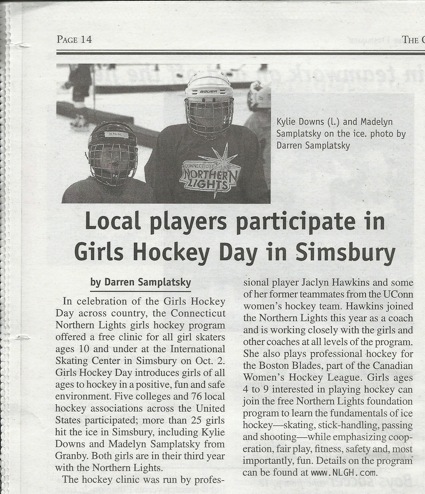 Below is an image of an article highlighting Girls Hockey Day and the CT Northern Lights. To see more pictures from the day, please visit our Facebook page by clicking HERE!